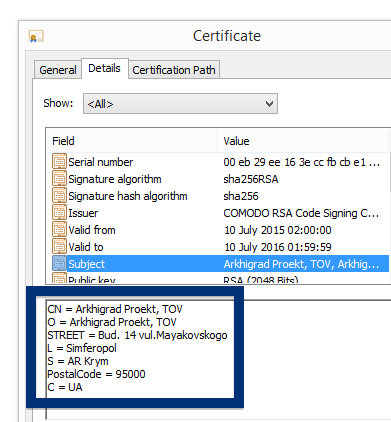 You can also view the certificate by right-clicking on the file, and looking under the Digital Signature tab: According to the embedded certificate we can see that Arkhigrad Proekt, TOV is located in Simferopol, Ukraine/Russia and that the certificate is issued by COMODO RSA Code Signing CA. 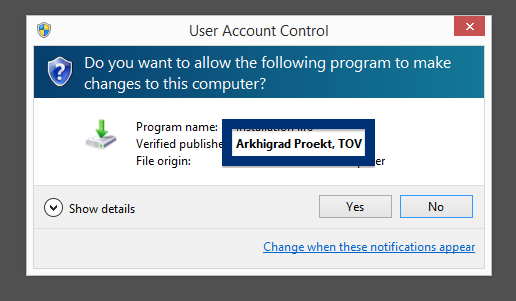 Did you also find a file digitally signed by Arkhigrad Proekt, TOV? Where did you find it and are the anti-virus programs detecting it? Please share in the comments below. In FreeFixer, the registryreviver.exe file shows up as listed in green since Corel Corporation, the company that digitally signed the file, is tagged as trusted. Did you just get a popup from adnetworkperformance.com and wonder where it came from? Did the adnetworkperformance.com ad appear to have been launched from a web site that under normal circumstances don’t use advertising such as pop-up windows? Or did the adnetworkperformance.com pop-up show up while you clicked a link on one of the big search engines, such as Google, Bing or Yahoo? 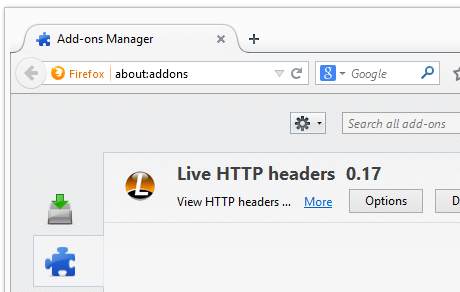 I’m not sure I remember this correctly, but I think I noticed reduxmediia.com in the address bar before adnetworkperformance.com loaded. Does this sound like what you see your computer, you most likely have some adware installed on your computer that pops up the adnetworkperformance.com ads. So there’s no use contacting the site owner. The ads are not coming from them. I’ll do my best to help you with the adnetworkperformance.com removal in this blog post. I found the adnetworkperformance.com pop-up on one of the lab machines where I have some adware running. I’ve talked about this in some of the previous blog posts. The adware was installed on purpose, and from time to time I check if something new has appeared, such as pop-up windows, new tabs in the browsers, injected ads on site that usually don’t show advertisements, or if some new files have been saved to the hard-drive. adnetworkperformance.com was created on 2015-04-27. adnetworkperformance.com resolves to 130.211.186.109. The domain is protected by Domains By Proxy, LLC. 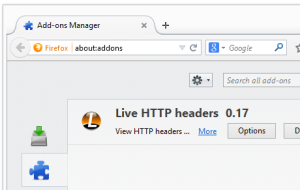 So, how do you remove the adnetworkperformance.com pop-up ads? On the machine where I got the adnetworkperformance.com ads I had Windows Menager, SmartComp Safe Network, gosearch.me and Live Malware Protection installed. I removed them with FreeFixer and that stopped the adnetworkperformance.com pop-ups and all the other ads I was getting in Mozilla Firefox. 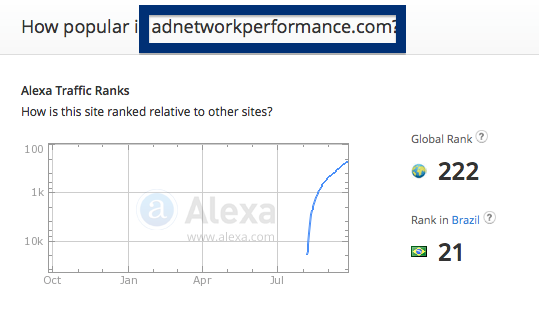 Rank 222 means the adnetworkperformance.com web site is getting a crazy amount of traffic. The issue with pop-ups such as this one is that it can be initiated by many variants of adware, not just the adware that’s installed on my machine. This makes it impossible to say exactly what you need to remove to stop the pop-ups. Do you see something strange-looking listed there or something that you don’t remember installing? Tip: Sort on the “Installed On” column to see if some program was installed about the same time as you started seeing the adnetworkperformance.com pop-ups. Then you can examine you browser add-ons. Adware often appear under the add-ons menu in Chrome, Firefox, Internet Explorer or Safari. Is there anything that looks suspicious? Something that you don’t remember installing? I think you will be able to find and uninstall the adware with the steps outlined above, but in case that did not work you can try the FreeFixer removal tool to identify and remove the adware. FreeFixer is a freeware tool that I started develop about 8 years ago. It’s a tool designed to manually find and uninstall unwanted software. When you’ve found the unwanted files you can simply tick a checkbox and click on the Fix button to remove the unwanted file. Did you find any adware on your machine? Did that stop the adnetworkperformance.com ads? Please post the name of the adware you uninstalled from your machine in the comment below. Having difficulties with pop-ups from reduxmediia.com? If so, you may have adware installed on your computer. I got the reduxmediia.com pop-ups in Firefox, but they can turn up if you are using Chrome, Internet Explorer, Safari or Opera too. After a while, I was redirected to another site. Does this sound like your experience, you almost certainly have some adware installed on your computer that pops up the reduxmediia.com ads. Contacting the site owner would be a waste of time. The ads are not coming from them. I’ll try help you to remove the reduxmediia.com pop-ups in this blog post. For those that are new to the blog: A little while back I dedicated a few of my lab computers and purposely installed some adware programs on them. Since then I’ve been observing the actions on these systems to see what kinds of advertisements that are displayed. I’m also looking on other interesting things such as if the adware updates itself automatically, or if it downloads additional unwanted software on the computers. I first found the reduxmediia.com pop-up on one of these lab machines. 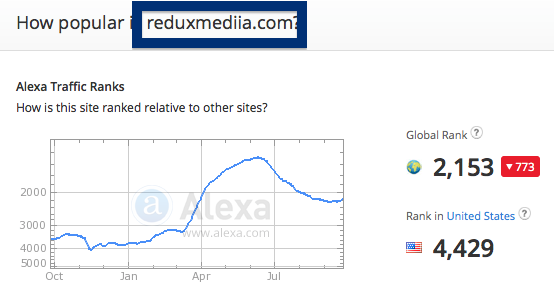 reduxmediia.com was created on 2012-06-21. The domain is protected by WHOIS PRIVACY PROTECTION SERVICE, INC. reduxmediia.com resolves to the 78.140.181.189 address. According to DomainTools is admngronline.com hosted on the same server. I also noticed a few other pop-ups, such as one from app.pckeeper.com. So, how do you remove the reduxmediia.com pop-up ads? On the machine where I got the reduxmediia.com ads I had Windows Menager, SmartComp Safe Network, gosearch.me and Live Malware Protection installed. I removed them with FreeFixer and that stopped the reduxmediia.com pop-ups and all the other ads I was getting in Mozilla Firefox. Do you see something dubious listed there or something that you don’t remember installing? Tip: Sort on the “Installed On” column to see if something was installed about the same time as you started observing the reduxmediia.com pop-ups. I think you will be able to identify and uninstall the adware with the steps outlined above, but in case that did not work you can try the FreeFixer removal tool to identify and remove the adware. FreeFixer is a freeware tool that I started develop many years ago. Freefixer is a tool built to manually track down and remove unwanted software. When you’ve identified the unwanted files you can simply tick a checkbox and click on the Fix button to remove the unwanted file. Did this blog post help you to remove the reduxmediia.com pop-up ads? Please let me know or how I can improve this blog post. Did you just get a pop-up from static.planet49.com and wonder where it came from? Did the static.planet49.com ad appear to have been popped up from a web site that under normal circumstances don’t use advertising such as pop-up windows? Or did the static.planet49.com pop-up show up while you clicked a link on one of the major search engines, such as Google, Bing or Yahoo? (I know, lots of watermarks. Have to do it to stop the copy-cats.) It’s a survey that claims that I could win a Volvo S60 car. If this sounds like what you are seeing on your machine, you presumably have some adware installed on your system that pops up the static.planet49.com ads. Contacting the owner of the site would be a waste of time. They are not responsible for the ads. I’ll do my best to help you remove the static.planet49.com pop-up in this blog post. I found the static.planet49.com pop-up on one of the lab systems where I have some adware running. I’ve talked about this in some of the previous blog posts. The adware was installed on purpose, and from time to time I check if anything new has appeared, such as pop-up windows, new tabs in the browsers, injected ads on web site that usually don’t show ads, or if some new files have been saved to the hard-drive. So, how do you remove the static.planet49.com pop-up ads? On the machine where I got the static.planet49.com ads I had istartsurf, MedPlayerNewVersion and Movie Wizard installed. I removed them with FreeFixer and that stopped the static.planet49.com pop-ups and all the other ads I was getting in Mozilla Firefox. The bad news with pop-ups such as this one is that it can be popped up by many variants of adware, not just the adware that’s installed on my system. This makes it impossible to say exactly what you need to remove to stop the pop-ups. Do you see something strange-looking in there or something that you don’t remember installing? Tip: Sort on the “Installed On” column to see if something was installed about the same time as you started getting the static.planet49.com pop-ups. The next thing to check would be your browser’s add-ons. Adware often appear under the add-ons dialog in Chrome, Firefox, Internet Explorer or Safari. Is there something that looks suspicious? Something that you don’t remember installing? I think most users will be able to find and uninstall the adware with the steps outlined above, but in case that did not work you can try the FreeFixer removal tool to identify and remove the adware. FreeFixer is a freeware tool that I started develop about 8 years ago. 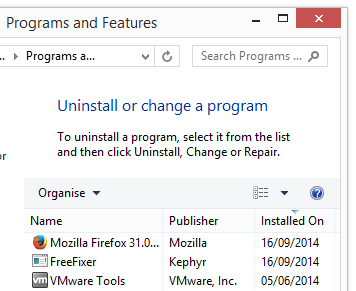 It’s a tool built to manually find and uninstall unwanted software. When you’ve found the unwanted files you can simply tick a checkbox and click on the Fix button to remove the unwanted file. FreeFixer’s removal feature is not locked down like many other removal tools out there. It will not require you to pay for the program just when you are about to remove the unwanted files. Did this blog post help you to remove the static.planet49.com pop-up ads? Please let me know or how I can improve this blog post. Hello! Just a quick post today, since I’m busy working with the next release of FreeFixer. 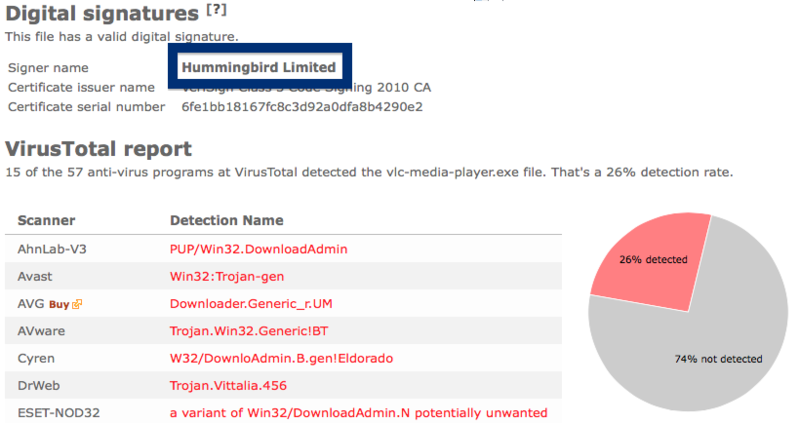 Did you see a file, such as vlc-media-player.exe, on your system digitally signed by Hummingbird Limited? Then read on.. The certificate information can also be viewed from Windows Explorer. 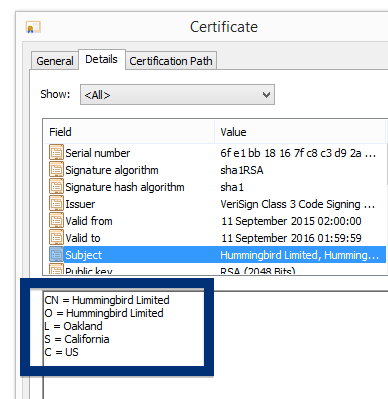 According to the embedded certificate we can see that Hummingbird Limited is located in Oakland in California, US and that the certificate is issued by VeriSign Class 3 Code Signing 2010 CA. 26% of the scanners detected the file. The vlc-media-player.exe file is detected as Trojan.Vittalia.456 by DrWeb, a variant of Win32/DownloadAdmin.N potentially unwanted by ESET-NOD32, PUP.Optional.DownLoadAdmin by Malwarebytes, DownloadAdmin by McAfee and Trojan.Win32.Generic!BT by VIPRE. Did you also find a Hummingbird Limited file? Do you remember where you downloaded it? Does this sound familiar? You see pop-up ads from lp.musicboxnewtab.com while browsing sites that generally don’t advertise in pop-up windows. The pop-ups manage to bypass the built-in pop-up blockers in Google Chrome, Mozilla Firefox, Internet Explorer or Safari. Perhaps the lp.musicboxnewtab.com pop-ups appear when clicking search results from Google? Or does the pop-ups show up even when you’re not browsing? Does this sound like what you see your computer, you presumably have some adware installed on your system that pops up the lp.musicboxnewtab.com ads. Contacting the site owner would be a waste of time. The ads are not coming from them. I’ll try help you to remove the lp.musicboxnewtab.com pop-ups in this blog post. For those that are new to the blog: Not long ago I dedicated a few of my lab computers and intentionally installed some adware programs on them. Since then I have been monitoring the behaviour on these machines to see what kinds of advertisements that are displayed. I’m also looking on other interesting things such as if the adware auto-updates, or if it installs additional unwanted software on the computers. I first spotted the lp.musicboxnewtab.com pop-up on one of these lab machines. 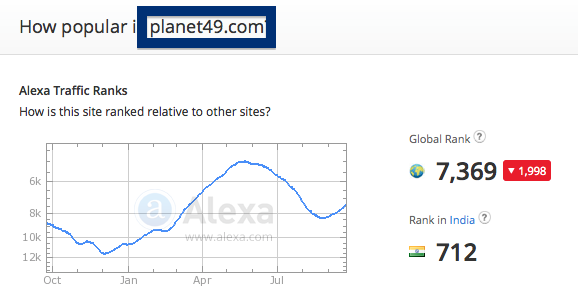 musicboxnewtab.com resolves to 94.31.0.55 IP and the same goes for lp.musicboxnewtab.com. lp.musicboxnewtab.com was registered on 2015-05-04. So, how do you remove the lp.musicboxnewtab.com pop-up ads? On the machine where I got the lp.musicboxnewtab.com ads I had istartsurf, MedPlayerNewVersion and Movie Wizard installed. 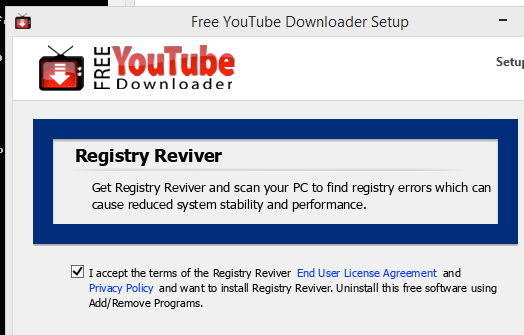 I removed them with FreeFixer and that stopped the lp.musicboxnewtab.com pop-ups and all the other ads I was getting in Mozilla Firefox. The problem with this type of pop-up is that it can be initiated by many variants of adware, not just the adware that’s installed on my system. This makes it impossible to say exactly what you need to remove to stop the pop-ups. Do you see something suspect in there or something that you don’t remember installing? Tip: Sort on the “Installed On” column to see if some program was installed approximately about the same time as you started seeing the lp.musicboxnewtab.com pop-ups. The next thing to check would be your browser’s add-ons. Adware often show up under the add-ons dialog in Mozilla Firefox, Google Chrome, Internet Explorer or Safari. Is there something that looks suspicious? Something that you don’t remember installing? I think most users will be able to track down and remove the adware with the steps outlined above, but in case that did not work you can try the FreeFixer removal tool to identify and remove the adware. FreeFixer is a freeware tool that I’ve developed since 2006. Freefixer is a tool designed to manually track down and remove unwanted software. When you’ve found the unwanted files you can simply tick a checkbox and click on the Fix button to remove the unwanted file. FreeFixer’s removal feature is not locked like many other removal tools out there. It will not require you to pay a fee just when you are about to remove the unwanted files. Did you find any adware on your machine? Did that stop the lp.musicboxnewtab.com ads? Please post the name of the adware you uninstalled from your machine in the comment below. If this sounds like what you are seeing on your system, you most likely have some adware installed on your computer that pops up the travian.com ads. Contacting the site owner would be a waste of time. The ads are not coming from them. The pop ups are most likely caused by some unwanted software on your machine. I’ll do my best to help you with the travian.com removal in this blog post. Those that have been reading this blog already know this, but for new visitors: A little while back I dedicated a few of my lab computers and intentionally installed some adware programs on them. Since then I have been following the actions on these systems to see what kinds of adverts that are displayed. I’m also looking on other interesting things such as if the adware auto-updates, or if it downloads and installs additional unwanted software on the systems. I first spotted the travian.com pop-up on one of these lab machines. So, how do you remove the travian.com pop-up ads? By removing the adware causing the pop ups. On the machine where I got the travian.com ads I had WebShield, mystartsearch, Wajam, PhaseProfessor, FastSearch, PrimaryColor, SSFK.exe, SFKEX64.exe, YTDownloader and acengine installed. I removed them with FreeFixer and that stopped the travian.com pop-ups and all the other ads I was getting in Mozilla Firefox. The pop pop-up ad was labelled with “Ads by GetPrivate“, however, I could not see anything installed named GetPrivate on my machine. What label did your pop up have? What label did your pop-up ad have? Please share in the comments area. The issue with pop-ups like this one is that it can be launched by many variants of adware. This makes it impossible to say exactly what you need to remove to stop the pop-ups. You can also check the browser add-ons. Same thing here, do you see something that you don’t remember installing? Did this blog post help you to remove the travian.com pop-up ads? Please let me know or how I can improve this blog post. Hi there! If you are a regular here on the FreeFixer blog, you know that I’ve been examining files that have a digital signature and bundle various types of potentially unwanted software. Today I found another publisher named LLC “LEVADIYA-PROEKT” that bundles some software. 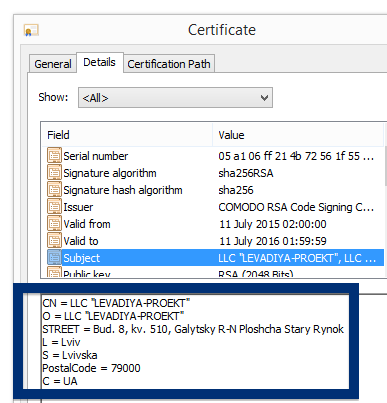 You can also see the LLC “LEVADIYA-PROEKT” certificate by looking under the Digital Signature tab on the file’s properties. According to the certificate, LLC “LEVADIYA-PROEKT” is located in Lviv, Ukraine. Comodo has issued the certificate. 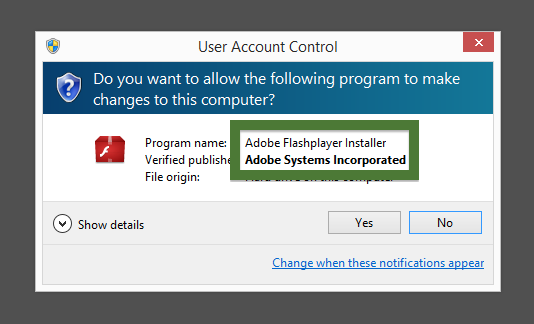 The issue is that FlashPlayer__6741_i1651201445_il1668.exe is not an official Adobe Flash Player download. If it was, it would have been digitally signed by Adobe Systems Incorporated. Here’s how the authentic Adobe Flash Player looks like when you double click on it. Notice that the “Verified publisher” says “Adobe Systems Incorporated”. 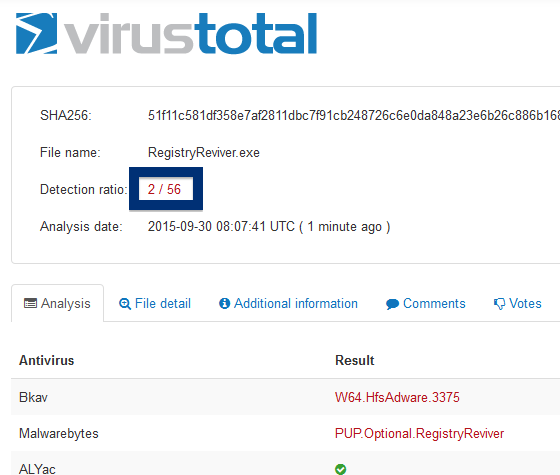 So, what does the anti-virus programs say about the LLC “LEVADIYA-PROEKT” file? 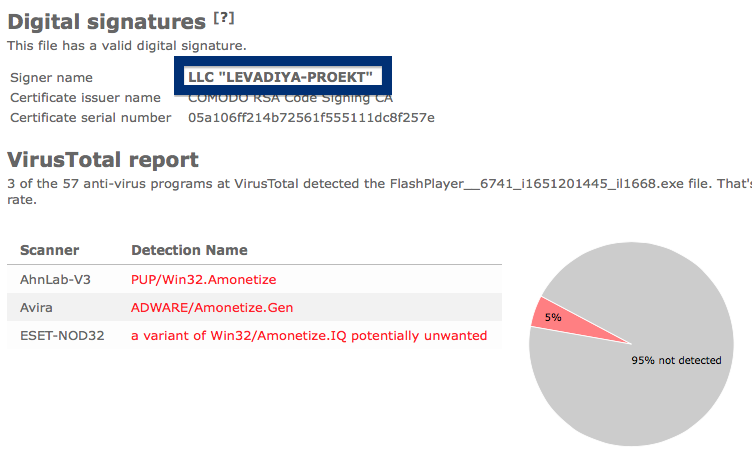 No problem, I just uploaded the file to VirusTotal and it turned out that a few of the anti-virus programs detects the LLC “LEVADIYA-PROEKT” file, with names such as ADWARE/Amonetize.Gen and a variant of Win32/Amonetize.IQ potentially unwanted. Did you also find a LLC “LEVADIYA-PROEKT” file? 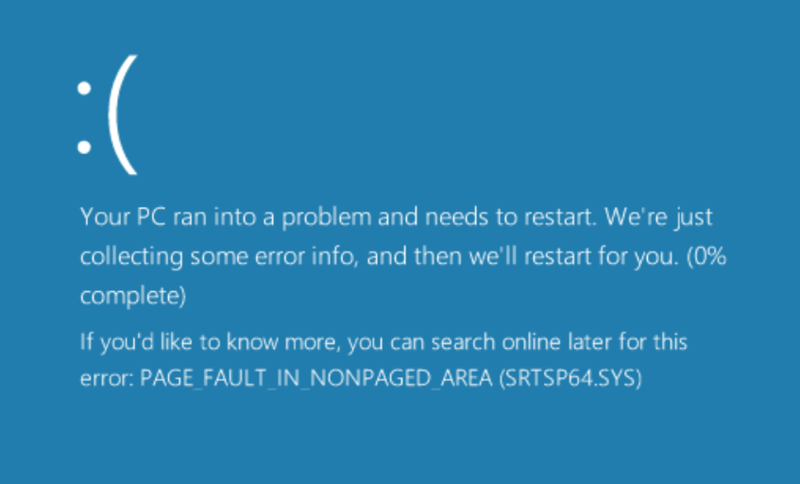 I ran into a blue screen this morning in SRTSP64.SYS, with the PAGE_FAULT_IN_NONPAGED_AREA and “Your PC Ran into a problem and needs to restart” error messages. I fixed the srtsp64.sys blue screen error by uninstalling Norton 360. I got this blue screen repeatedly, a few minutes after booting my Windows 8 machine. I figured out that SRTSP64.SYS was a Symantec driver by looking in regedit, where it appeared with the “Symantec Real Time Storage Protection x64” name. I fixed the PAGE_FAULT_IN_NONPAGED_AREA / SRTSP64.sys blue screen by first restarting the machine into safe mode, and then I uninstalled Norton 360 from the Windows Control Panel. Did that help you solve the SRTSP64.sys bluescreen problem? Did you find another solution to the SRTSP64.sys error which did not involve uninstalling Norton 360?